Josefina V. Sillona, was hired in the Company in July 1, 1996 as Internal Auditor. 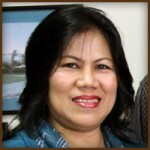 With more than 11 years experience as an Auditor with the Philippine Government’s Commission on audit , Sillona performed her functions as Internal Auditor and established the Company’s Internal Control Checklist, Human Resources Manual, Personnel Management Manual, and the Personnel Handbook. In the following year, Sillona was appointed Quality Management Representative, responsible for the preparation and maintenance of Stamm Quality Management System . With the help of foreign counterparts, Sillona helped in the formulation of the Company’s Quality Manual, Job Description Manual and Procedures Manual. Under Sillona’s function as Quality Management Representative, a Quality Certification was obtained from, TÜV SÜD PSB Philippines, Inc., an international certification body, in May 2014, the Company’s 4th Quality Certification. In 1999, currently holding the position of Quality Management Representative, Sillona was also appointed Manager of Stamm Technic, Inc., the technical sales arm of the Company, which distributes industrial sewing machines, ironing equipment, thread, needles, spare parts and other sewing accessories for the leather and the garment industry. Sillona graduated in 1975, with a degree in Bachelor of Science in Business Administration, majoring in Accounting from the University of the East, where she was awarded half scholarship recognitions. Sillona passed the Certified Public Accountant licensure examination in 1976. Presently she is a member of the Philippine Institute of Certified Public Accountant, Metro Manila Chapter.